I have to warn you that I don't do food reviews. But here I am again doing a food post. I say this because I did a food post before. 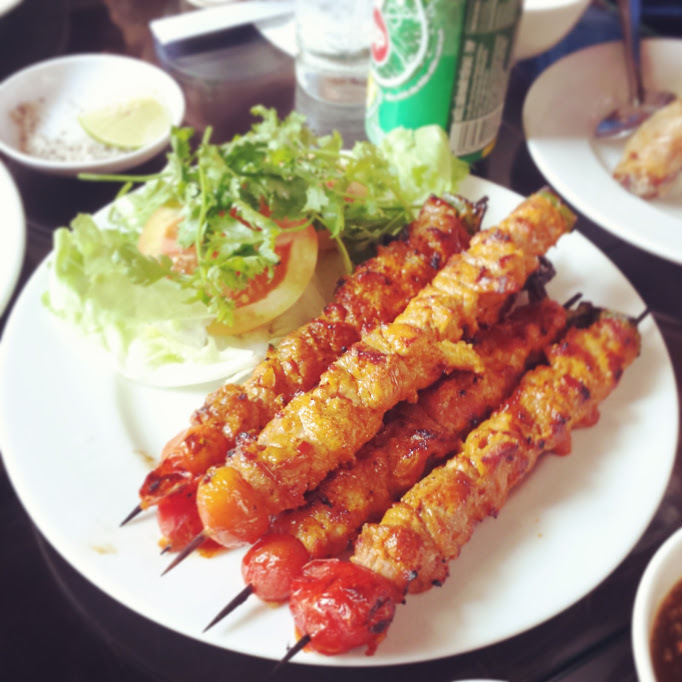 Check out my first food post titled Cebu Eats. We'll, I don't want to miss this opportunity of sharing my Vietnam food explorations with you because my trip has been a palate changing event in my life. And I'm preaching this to you because this can be a palate changing event in your life too. Ahaha! The truth is, I'm not really a fan of Vietnamese cuisine however that has been changed since my trip to Vietnam. 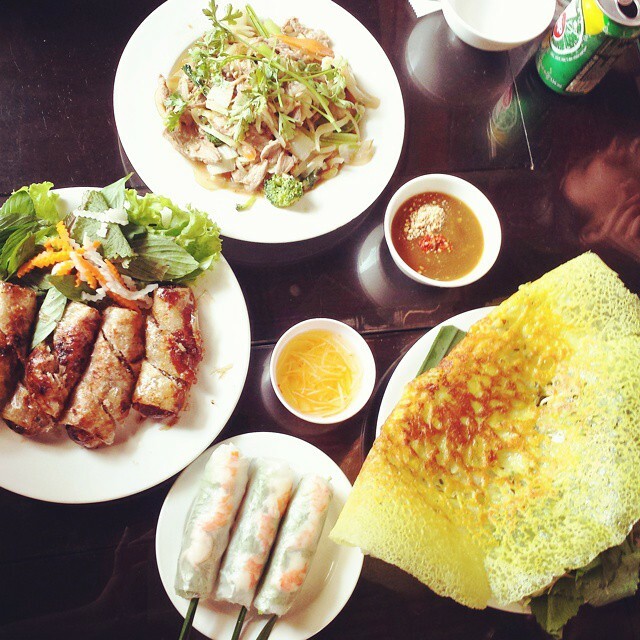 So today, I'll be sharing with tips on where to eat when in Vietnam. Warning: This is not your typical food post. 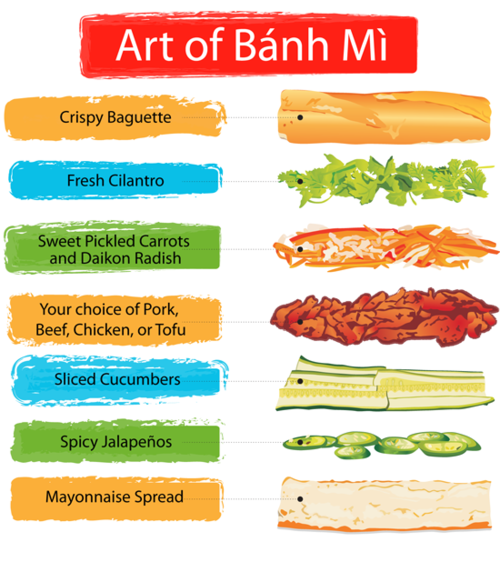 What is banh mi? Let the picture below explain it properly. My brother in law bought us banh mi for breakfast after fetching us at the airport. I immediately thought Subway. However when I've put it on my mouth I was like, "This one taste much much more better than Subway!" Sorry Subway, I'm just being honest. This can be bought at any vendors along the streets of Vietnam, however you should check the hygiene first before deciding to buy. You know, you don't want to get diarrhea when travelling. If you want to be extra sure with cleanliness and hygiene (which is fair enough) then check out Highlands Coffee. They also sell banh mi. Pair your banh mi with a cold or hot coffee too. They serve very good coffee. ;) Highlands Coffee is not that hard to find as they are located in almost every street corners as well. The restaurant is housed in a quaint french villa. They serve authentic Vietnamese food. I just love their fresh spring rolls while my husband is drooling over their friend spring rolls. 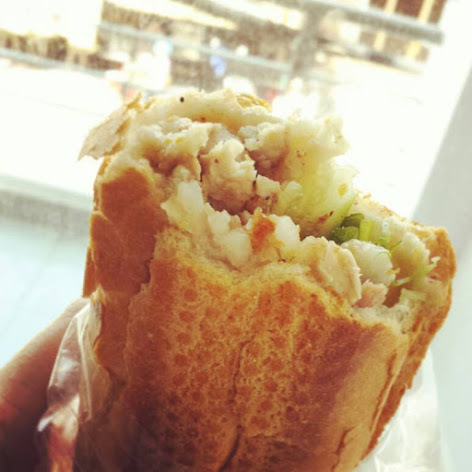 The restaurant is located at 160 Pasteur, Phurong Ben Nghe, Quan 1, Ho Chi Minh City, Vietnam. This restaurant is my husband's favorite. He loves bacon. I love bacon. And we are like happy brats indulging ourselves to our bellies content. They only serve 2 menu items: friend spring roll (cooked in Northen Vietnam style) and a bun cha yet they are full house. Location : 30 Ba Thanh Quan 6, Ho Chi Minh City, Vietnam. This is not your typical cafe because it's a fashion, lifestyle, cafe, gallery. 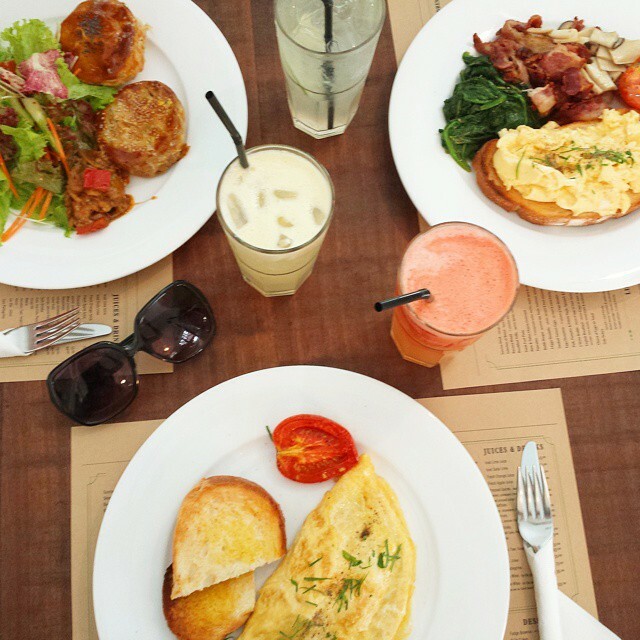 We went here for brunch on Day 2 of our Vietnam trip. My brother in law said, we should go for English breakfast since we've been eating a lot of Vietnamese food yesterday. And so we went. The stairs leading to the restaurant is dilapidated. It's like the mercado (wet market) where my grandmother buys her ingredients as well as her daily necessities but when we've arrived upstairs we're surprised to find a quaint restaurant with a touch of modern vintage. The feel is like dining in Paris. Nah! It's just my overly active imagination. After having brunch, we then went to the shop (located on the same spot as the cafe) to browse. Me and hubby wanted to buy their scented candles but it's just too expensive. :(( It's around 600,000 VND - 700,000 VND if I'm not mistaken. I just don't find the amount justifiable for a candle. Location : 151 Dong Khoi St, District 1, Ho Chi Minh City, Vietnam. 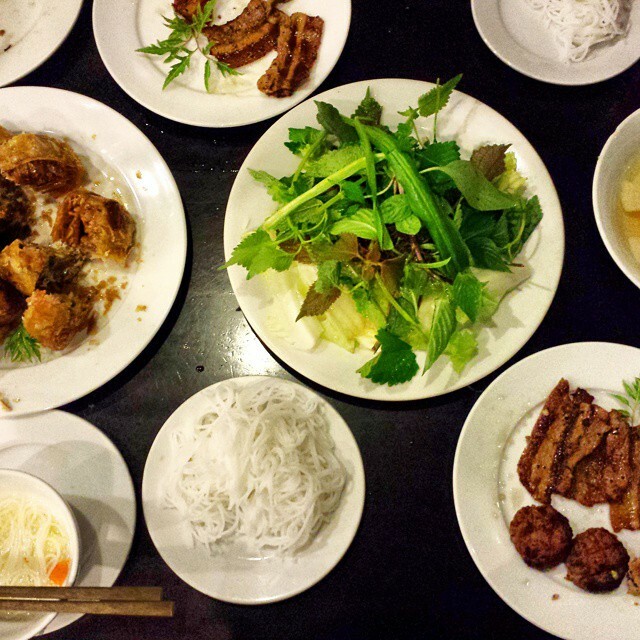 I've already mentioned this restaurant above, however I wanted to iterate it like a broken record so that you'll remember visiting this restaurant when you get to Vietnam. You should try their coffee. When on a beach holiday, you just can't miss seafood. I love seafood. I grew up in Cebu, Philippines where there's plenty of cheap seafood. We went to Nha Trang which is a 40 minute flight from Ho Chi Minh City. It's a seaside city with flocks of Russian tourists. When in Nha Trang, seafood is a must. May I suggest you to go to Lousiane Brewhouse because they serve the best plus they have their own brewery, we'll that if you're a beeraholic. The seafood may come a bit pricey as some menu items are sold per kilogram. But if you're a food fanatic like me and hubby then it's just worth it. Locaton : Lot 29, Tran Phu, Nha Trang - Vietnam. Note : I'm not paid to do this so you can guarantee that it's an unbiased referral. I guarantee you that these restaurant serves the best. Oh, I can't wait for you to try them all. Looks delicious! Hope your having a great time.